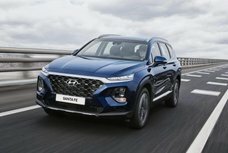 In order to help Filipino car buyers keep up with latest Hyundai Tucson price in the Philippines, Philkotse.com provides regularly updated Hyundai Tucson price list as follows. Please note that these are prices listed in some showrooms and should serve as reference only. 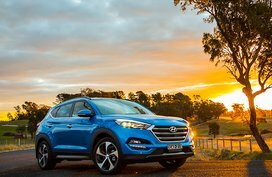 For more accurate pricing information, please refer to the Hyundai Tucson for sale section. The Hyundai Tucson is one of the most renowned Hyundai models in the Philippine car market. It has been 13 years since the first Tucson was introduced and at the present, it is running the third iteration in our shores. 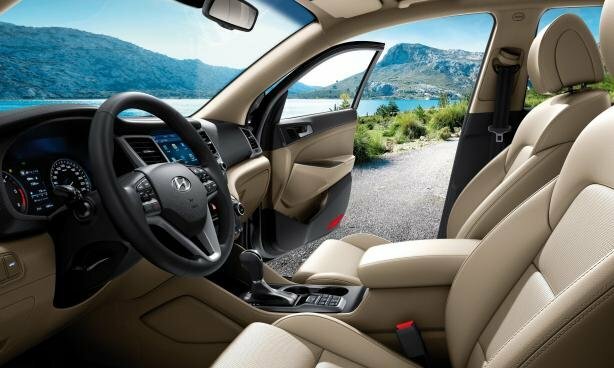 Now, you can put the first and the latest generations together to clearly see how the Tucson has grown up. 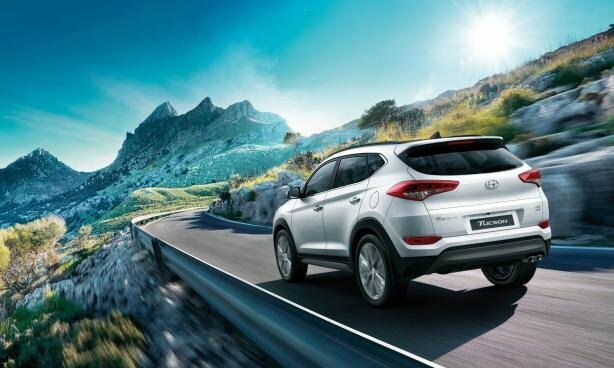 With a glossy but rugged look, the all-new Hyundai Tucson 2019 is a perfect combination between innovation and premium comfort. 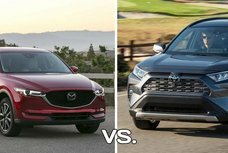 Besides, thanks to highly-optimized body structure and high-speed stability, the SUV exudes innovative engineering to enhance aerodynamics. 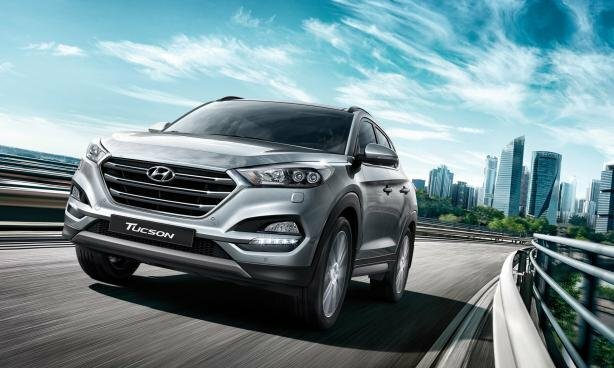 In contrast to its small size, the Tucson comes with a potent 2.0L engine which is available in both gasoline and diesel guises. The gasoline engine can muster 156 hp and 196 Nm of torque while the diesel unit is well capable of 178 hp and 400 Nm. In particular, the latter has got a 4WD trim level. All variants are paired with a 6-speed automatic gearbox. Concerning the price, the 2019 Hyundai Tucson price sees a slight increase from P10,000 to P117,000 due to new excise taxes. Owing to new excise taxes, the Hyundai Tucson price is a bit higher in 2019. For more meticulous details, take a look at the up-to-date Hyundai Tucson price in the Philippines this month below. For 2019, the price tag of the Hyundai Tucson 2.0 GL 4x2 AT variant augmented by P27,000, increasing its price to P1,245,000. Meanwhile, the MT trim recorded a sharper growth in price of P30,000, pushing its price up to P1,158,000. The Tucson 2.0 CRDi GL 4x2 AT only experienced an insignificant rise of P10,000 in its price when compared to other models in the lineup, giving it a new price tag of P1,1398,000 in 2019. The 2.0 CRDi GLS AT 2019 4x2 variant witnessed the most dramatic increase in price. To bring home a 2019 model year, you have to pay for P1,715,000 versus P1,598,000 in 2017. On the other hand, the top-of-the-line 4x4 grade can be had for P2,115,000, which is P27,000 pricier than 2018 price. 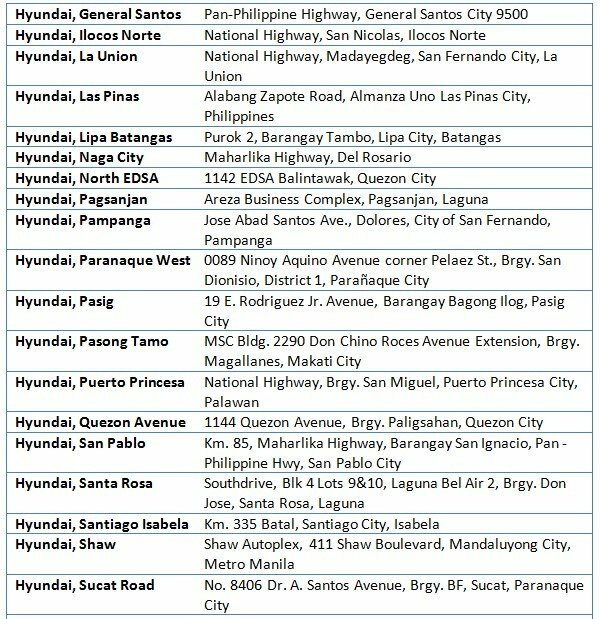 Hyundai PH is expanding to better serve you with a dense network of dealerships across the Philippines. 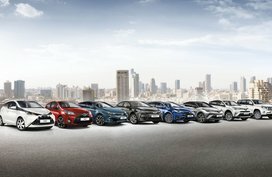 Search for the nearest dealer to you and drive home your very own Hyundai vehicle. 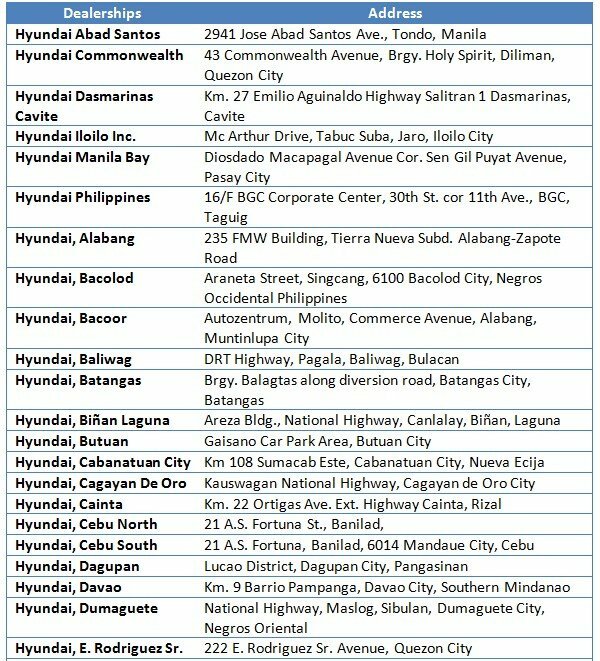 Below are the list of Hyundai dealerships in the Philippines accompanied with address details. 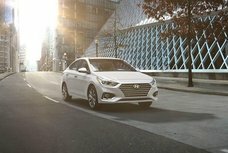 Hyundai denotes “modernity”. 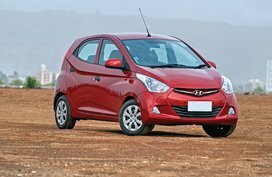 As its name implies, one of the most outstanding features of Hyundai is its agility and flexibility to take timely changes to keep pace with the latest trends in the auto world. Hyundai Motor Company (HMC) was established in 1946 initially as a construction and engineering company. In April 29th, 1967, it officially incorporated automobile production, arousing Korea's momentum in the global motoring industry besides Kia Motors. HMC soon realized that its next mission was to reach out to the global markets, and it really started to blossom in the 70s, 80s, and 90s. 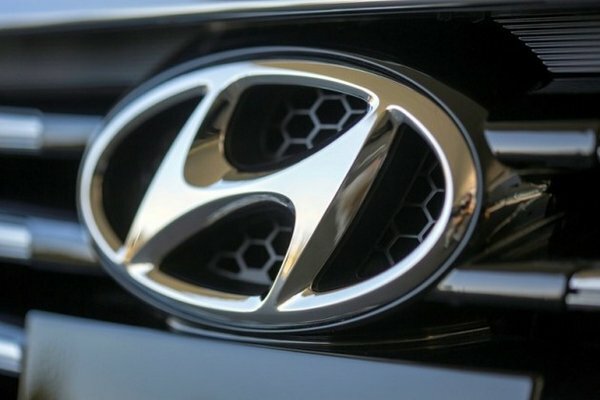 Since then, Hyundai has always maintained its position as a reputed, qualified and outstanding brand in the world auto industry. The Korean car brand has gone through more than 70 years of restless pursuit of the latest and most modern, with a massive number of updates and facelifts on all of its model lineup. 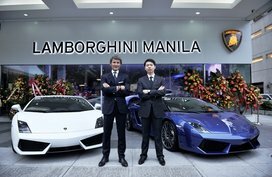 With that, the Korean auto manufacturer has gained a great success throughout the world and the Philippines is not an exception. In August 2001, Hyundai Asia Resources, Inc. (HARI) became the official distributor of Hyundai cars in our local market. 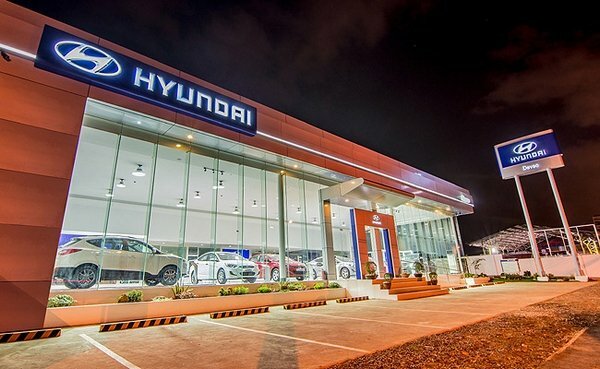 With a young and energetic personnel and an extensive network of facility with over 40 dealerships across the Philippines, the company has earned its position as the 3rd biggest automaker in our country and has received high appreciation from the Philippine government, HMC, private agencies as well as consumers for having the best practices in corporate governance.